The bold force behind the Financial District's rising social status, W New York - Downtown upturns staid Wall Street expectations with radiating energy, just minutes from the Statue of Liberty, New York Stock Exchange, 1 World Trade Center and more. Sip cocktails in our 5th floor Living Room Bar and Terrace, looking out on sweeping views of Lower Manhattan and the Financial District. Work up a sweat at FIT. Connect at WIRED Business Center or celebrate in our ample meetings and events space. 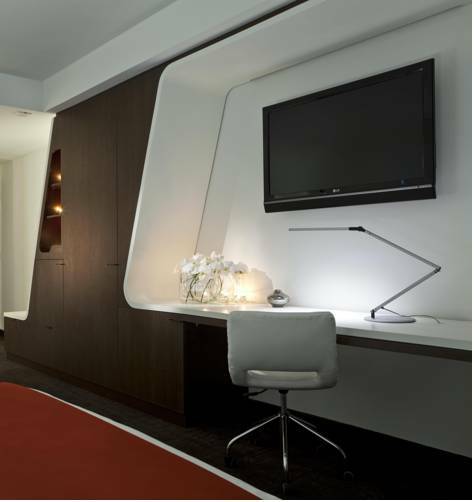 Each of our 214 hotel rooms and 3 suites, spread over 22 floors, remixes signature W beds and creative amenities, like innovative technology, in-room entertainment and W MixBar. For everything else, there's Whatever/Whenever . Just ask. Living Room Bar + Terrace: Sip drinks and survey the scene amidst curated music and breathtaking Financial District views at our boldly designed bar. Located on the fifth floor of the hotel, Living Room Bar + Terrace is your go-to spot for toasting a successful day in downtown NYC.